The Amish American Salvaged Barn Wood Trestle Table is handcrafted just for you and your home. Gather comfortably with family and friends at this genuine Shaker piece. Feast and chat for hours on end, perched beside this solid hardwood, rectangle top dining table. Enjoy this trestle base, keyed through to create a unique design aspect. Perfect for any occasion, enjoy casual dining atop this beautiful wood structure. Or, drape a tablecloth, knowing that the sturdy dining table can handle even your largest meals. Reclaim your individual style by making this piece the centerpiece of your dining space. 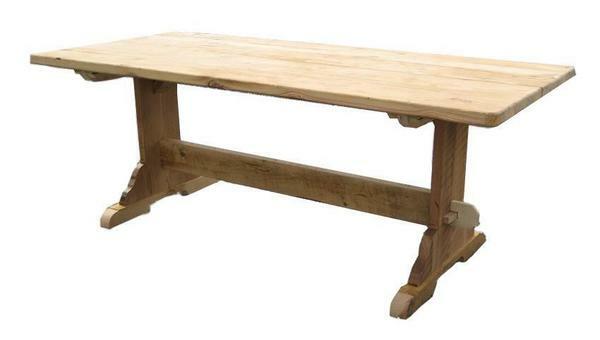 If salvaged or reclaimed wood furniture peaks your interest, check out our similar Amish Reclaimed Plank Farm Table. Please call 1-866-272-6773 with questions, comments, or ordering assistance. If the pictures of all our stunning furniture on our website intrigues you, stop by and visit our Amish furniture store in Sarasota, Florida to see some of our pieces in person! Standard Width: 36" to 40"
Table Top: 3/4" to 1-1/4"
Overall Drawer Depth: 3 1/2"
Inside Drawer Depth: 2 1/2"
Drawers are made from new pine wood. Drawers are notched, nailed and glued together.